Bikes – Purchase a demo bike. Only 4 left! Shoes – Save up to 50% off of last year’s shoes. Brands include Specialized, Pearl Izumi, Louis Garneau, Giant, Five Ten, and BONT. We have shoes for both road and mountain bike riding, as well as for men and women. Many sizes, manufacturers, and styles to choose from so get in on the savings before the picking gets slim. Winter tops – Save up to 60% off of winter jackets. Brands include Louis Garneau, Craft, 02 Rainwear, Outdoor Research, Race Face and Specialized. Items vary from hooded, to insulated, waterproof and wind/water resistant. Again, we have many styles available for both men and women. Check them out now and cash in on some really great deals on cycling apparel. Shorts – Save big on men’s cycling shorts. Sorry ladies, this sale is for the men, that is if you prefer to wear ladies only shorts. These shorts and men’s baggies are on sale. Brands include Specialized, Royal Racing, Race Face, and 100%. While you’re at it, you might as well make a full sweep on the savings. Cash in on our spring service specials. Choose which bike service special is best for you. What do you think about this crazy, awesome sale? Stop into Peak Cycles in Golden, Colorado to see what else you might find in the store. We have over 50 different types of bikes on sale and even more different types of bike parts, cycling accessories, and cycling apparel. See you soon! Getting a big tax refund? Maybe not even a big one but just some extra cash? Don’t let it go to waste! Invest it! Invest it in yourself: your health, wellbeing, and peace of mind. It’s not every day when you have a small or large windfall come your way where you can purchase guilt-free items. So why not make your tax refund count for something that will enrich your life and your health? Following are 5 great ideas for your income tax refund that you won’t regret doing. #1 Buy a new road or mountain bike. We’ve got Specialized, Liv, and Giant bikes in the shop. Check out the new bicycles we have online at BikeParts.com. And if you need to upgrade your bike purchasing skills, check out our post What to Look for When Buying a Bike to guide you. #3 Take advantage of our spring service special. Get a safety or standard tune-up, a Drivetrain Degrease and Tune or even a comprehensive overhaul for your road or mountain bike. #4 Make a date with our bike fitter, George Mullen. Use that extra cash to dial in your saddle, shoes, bike parts and frame geometry to your body and riding style. We offer a professional Bicycle Fit Studio with either a 3 Dimensional Fit or Dynamic 3 Dimensional Fit (includes detailed Computrainer™ session). To set an appointment for a fit, please contact George Mullen at 303 522-1494 or by email at gjmmullen@yahoo.com. #5 Get new gear! Whether you are in the market for jerseys, short, glove, shoes, hydration packs or even bike parts, we have got it all! in fact, have you seen our catalog of bike parts? It’s crazy! We have over 45,000 parts and 700+ manufacturers! This means we have all the road bike, MTB, cycling tools, and cycling accessories you could ever dream of. Investing in your health and wellbeing is not only a smart way to use your tax refund dollars but a wise one! Be wise. 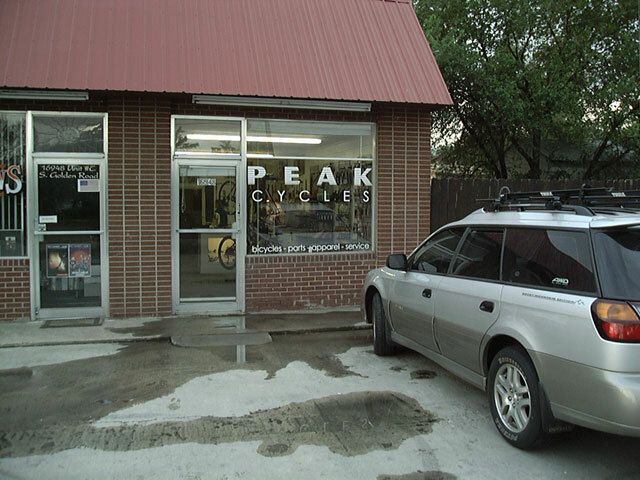 Stop by Peak Cycles Bicycle Shop for your guilt-free purchases of bike parts and cycling gear. See you soon! You and your bike have worked hard this past season. Think of all the training miles, epic rides, races, and events you have done. Don’t you think it might be time for a little rest and relaxation? If not that, at least it’s time to replenish and restore from all the hard efforts. At Peak Cycles Bicycle Shop, we think of this time of year as the time to make continued gains – gains in bike parts that is! It’s that time of the year when bikes, cycling apparel, bike parts, and cycling gear all go on sale and it’s the time to take advantage of closeouts and sales. Investing in your cycling regimen is an investment in you, your health, and wellbeing. Here’s how to make the most of the sizzling hot bike deals we’ve got going. Newer bikes are rolling out so stop by the shop and check out the 2016 bike closeouts featuring Specialized and Giant bikes. If you aren’t in the market for a new bike, then guess what? Our daily deals offer ongoing specials for your to cash in on. Specials range from deals on bike parts, tires, shoes, pedals, lights, and all kinds of cycling accessories. To cash in on these deals, visit our daily closeout and sale section. If you’ve wanted to try something new, now is the time to do it. Buy it at a discount and experiment with your bike set up. With so many bike parts – the question is what to purchase? Consider getting a high quality wheel set. A good wheel set impacts ride quality, ease of pedaling, reliability, and functionality. Maybe purchase some new, lighter tires for your wheels. Another option is to reconsider the current crank set and pedals setup. Again, you’ll need to stop by or call the shop for details but you never know what is available unless you ask! Replace bike parts regularly. Don’t wait until you hear odd little noises or you notice that your bike is taking too long for the brakes to engage before investigating. Some parts of a bike have a set “wear life”. As you put in the miles, they gradually wear out and need to be replaced. Typically, this includes chains, cassettes, chainrings, brake pads, and cleats. If you plan to ride through the winter months, stay one step ahead of the game by purchasing these types of bike parts on sale and have them on hand when you need them. The end of the year is the best time to find huge discounts on new bikes. Here at Peak Cycles, we’ve got a handful of closeout 2015 men’s and women’s bikes that are all 20% off or more. 2015 Liv Lust Advanced 0. 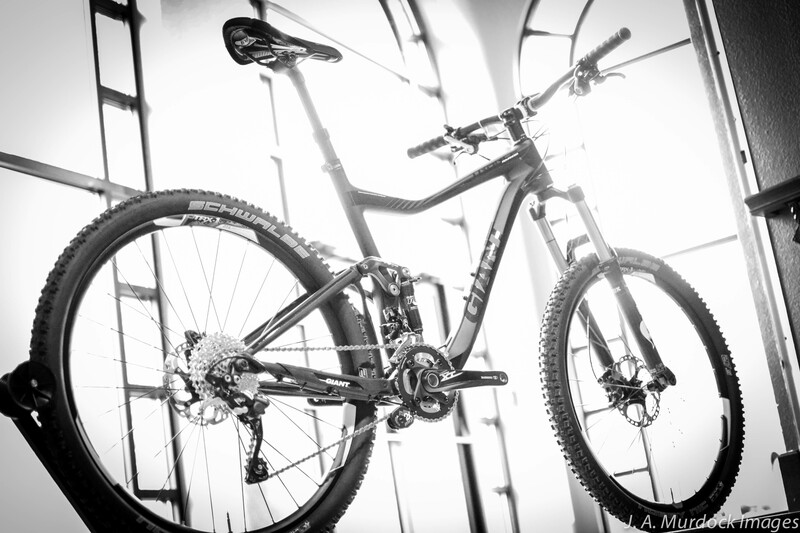 The trail-slaying crown jewel of our 2015 women’s mountain bikes is the Liv Lust Advanced 0. 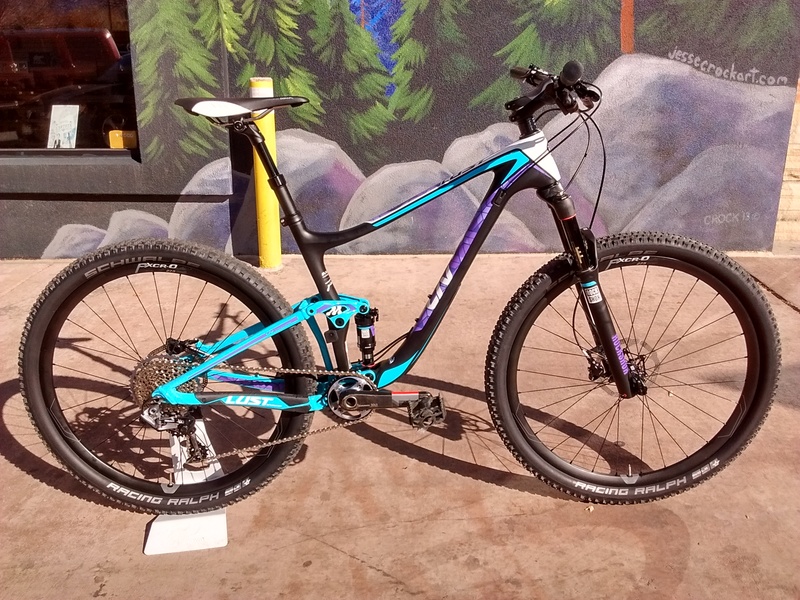 This bike is packed with top shelf components and is designed exclusively for women. It features Liv geometry and women’s specific bike parts like narrower handlebars, Liv silicone grips, and a Fizik Arione Donna saddle. Designed to be a fast, well balanced mountain bike, it has nimble yet stable handling that make it a Jill-of-all-trades. It’s a capable cross-country race machine yet comfortable enough for a fun, all day trail adventure. Check out more pictures and details in the rest of the post! The 2015 USA Pro Challenge is on! With only 3 days before the final stage, pro cyclist will race a short loop north of Golden before tackling the main obstacle of the day, the 4-mile climb of Lookout Mtn. The final stage from Golden to Denver on August 23 is proven to be stellar spectating. And what better way to have the best spectating experience during the race than to stop by the Peak Cycles Bicycle Shop during Stage 7 of the USA Pro Challenge. Here’s why! 1. 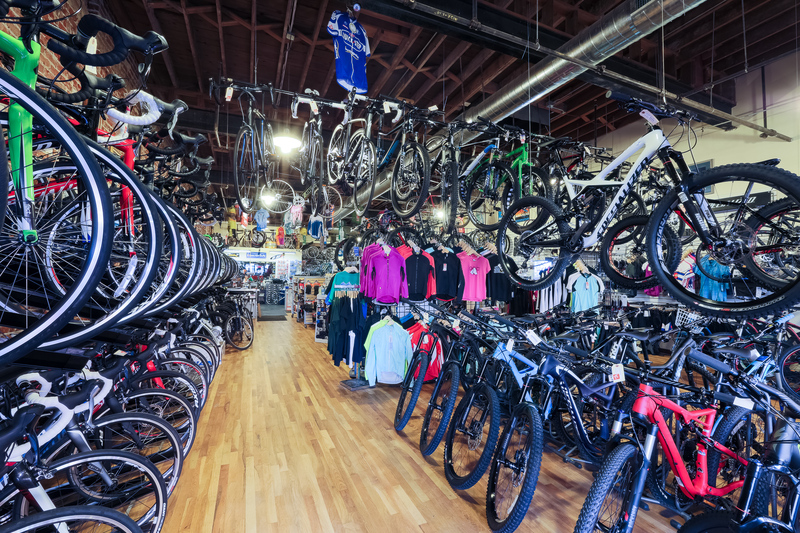 When most walk into our Peak Cycles Bicycle Shop in Golden, Colorado, they are confronted by a dazzling display of road bikes, mountain bikes, cycling accessories, and cycling apparel. It’s enough to make your head spin! Enjoy the delightful appeal of a local, mountain town bicycle shop. 2. 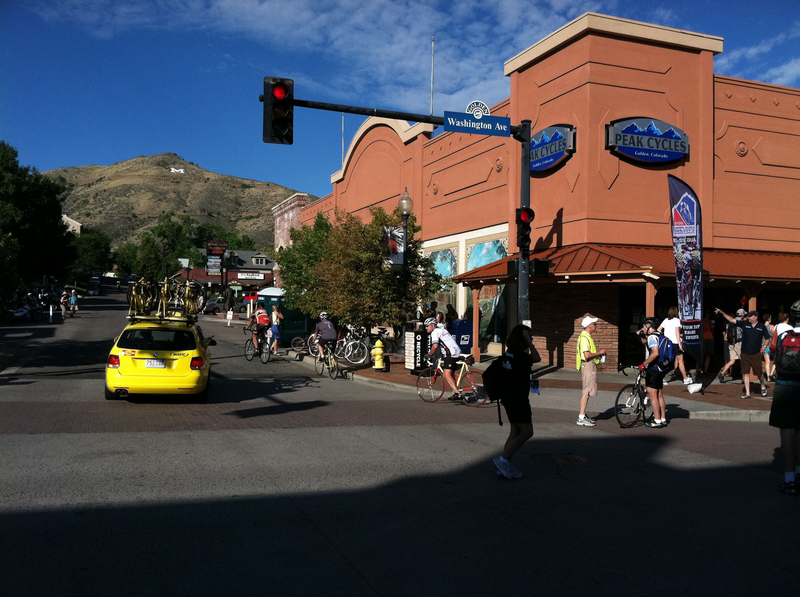 Located in the heart of Golden, on Washington Avenue, Peak Cycles Bicycle Shop is strategically placed offering you one of the best places to watch the pro cyclist through Golden, Colorado. 3. Not only that, Peak Cycles Bicycle Shop will be open this Sunday 9-11 and 1-4. 4. We’ll have food and drinks for a USA Pro Challenge party on Sunday. 5. Best yet – we will be selling USA Pro Challenge T-shirts in the store all week. 6. You love the USA Pro Challenge and so do we! We’ve been involved in supporting the race since the inaugural race. Support the locals who support the race! 7. Make good use of your day. During the break between the women’s race and the men’s race, you can get your bike fix on! Browse through our road bikes and mountain bikes like Giant, and Specialized and check out our specialty bike parts. Our highly rated bike parts and components have become favorites among many. 8. In fact, make the day memorable and pick up a select few bike parts, cycling accessories, or cycling apparel. 9. Get your bike questions answered. We love answering questions and talking about the latest and greatest. Asking good questions about your bike and bike parts leads to having the right bike and gear that not only gets you on the bike, but keeps you riding. 10. Last but not least, the best reason to visit Peak Cycles Bicycle Shop during the Pro Cycling Challenge is because we love cycling! As avid local cycling advocates as well as sharing our expertise on the web at bike parts.com, we encourage cyclist of all levels to embrace our fabulous sport. See you Sunday and good luck to all racing the USA Pro Challenge! Out with the old – in with the new. That’s pretty much the motto of the New Year. As we transition from the last year into the new one, it causes many to reflect on the past. Thoughtfulness and evaluation of cycling progress and fitness gained, review of goals achieved, as well as, forward thinking dreams and compelling images of a future to live into. What will 2015 bring? At Peak Cycles Bicycle Shop, we invite you to join us on a visual journey of years past. We also hope 2015 will bring more of what we’ve accomplished in servicing our customers these last few years. Staring with humble beginnings here in Golden, Colorado, not only has our shop grown locally, but it has also expanded world wide with our BikeParts.com website. Reflecting on our growth, it’s easy to attribute our growth to carrying quality brands like Giant, Specialized, Pearl Izumi and specialty bike parts. Our highly rated bike parts and components have become favorites among many. But offering the best cycling apparel and bicycles isn’t what has really fueled our growth. 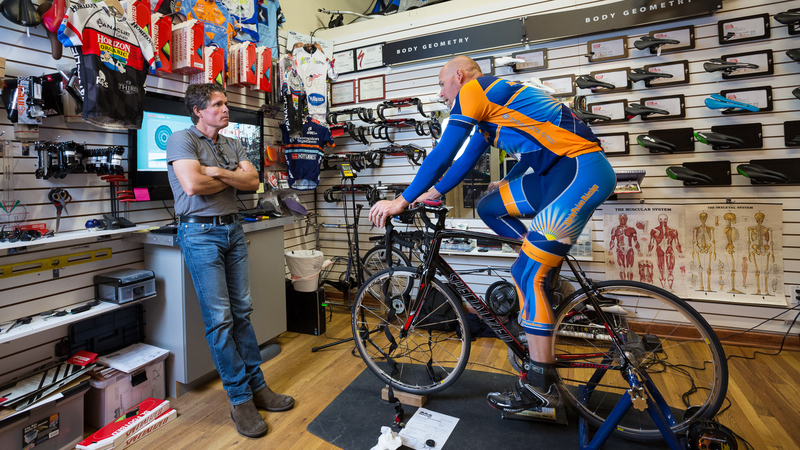 No different than training, maintaining dietary and fitness routines, and racing to optimize fitness, our bike shop has focused on our own training regimen: Quality customer care. Timely services repairs. Educated and informed product use. Excellent bike fits. Fun shop rides. And most of all, fully supporting our local community and customers. Looking to the past, it’s been rewarding to bring the Pro Cycling Challenge to Golden, Colorado. We’ve embraced the sponsoring of bicycle recycling programs, local racers, and community events. As we reflect on year’s past, it’s with gratitude to our customers, the City of Golden, and our fellow cyclist that we celebrate how far we’ve come. More so, it is with enthusiasm and full commitment to serve and help our customers that we look to a bright and prosperous future. Wishing you a year that is filled with all the joys, personal rewards, and the grand adventure that cycling brings. Happy New Year 2015. With the benefits of both a 29er and 26er, 27.5 inch wheels have made a big splash in the mountain bike world this year. After over a decade of smaller builders and a few mass-production brands utilizing the standard, the floodgates were opened in 2014 and 27.5 inch wheels rocketed to the top of the list of mainstream innovations. One of the brands leading the charge with light, high-performance and affordable 27.5 bikes is Giant. The 2014 Trance represents the culmination of incredible research and development as well as rider testing under the likes of Adam Craig and Carl Decker. We have a few of these in the shop (and one for demo!). Jump past the break to see why we can’t wait to shred this new bike. 5 inches of suspension and 27.5 wheels make even the gnarliest of trails heavenly.